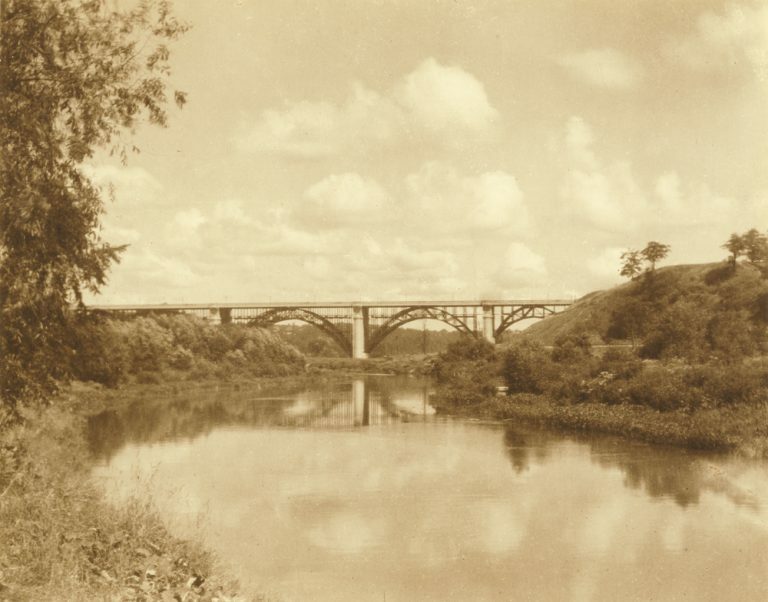 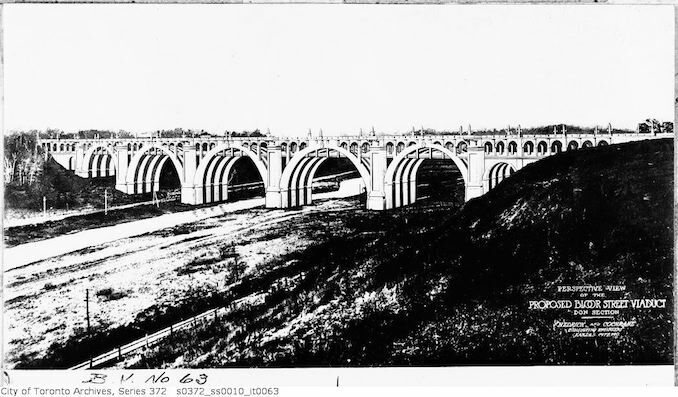 Designed by Edmund W. Burke, the Prince Edward Viaduct, or the Bloor Street Viaduct as you may know it, connects Bloor Street East with Danforth Avenue. 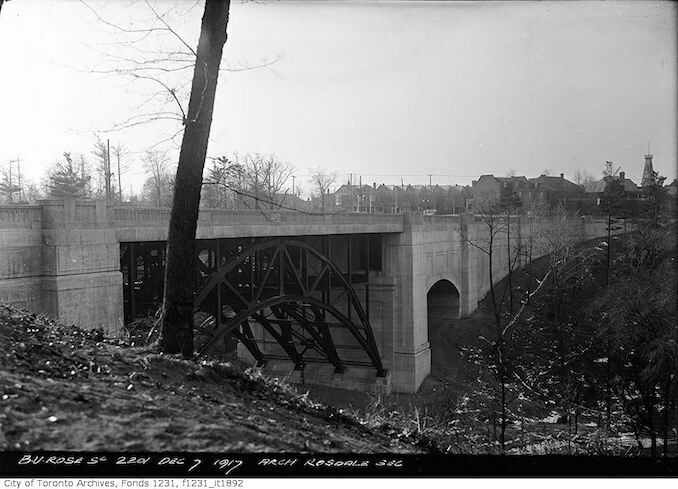 The length of it runs 494 metres at 40 metres above the Don Valley below. 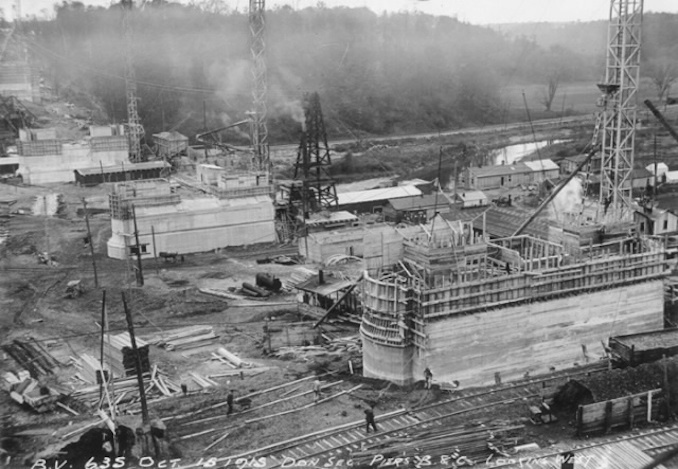 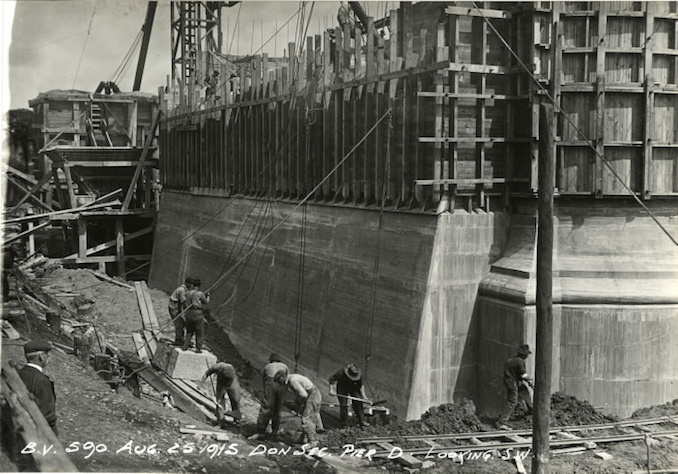 This year, we will be celebrating its 100th year as it was officially opened on October 18th, 1918. 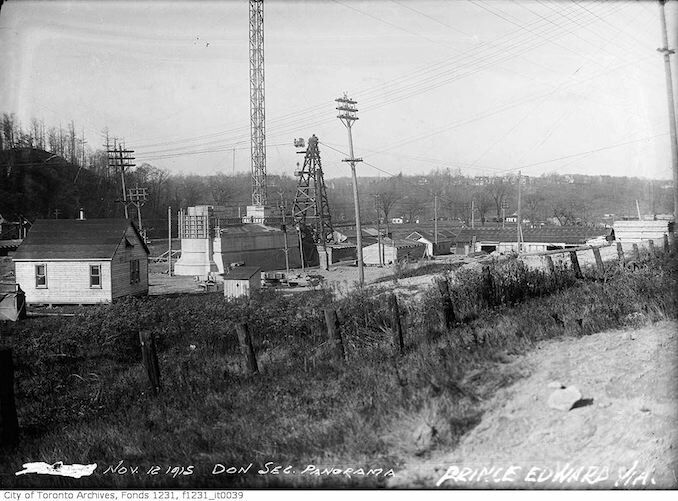 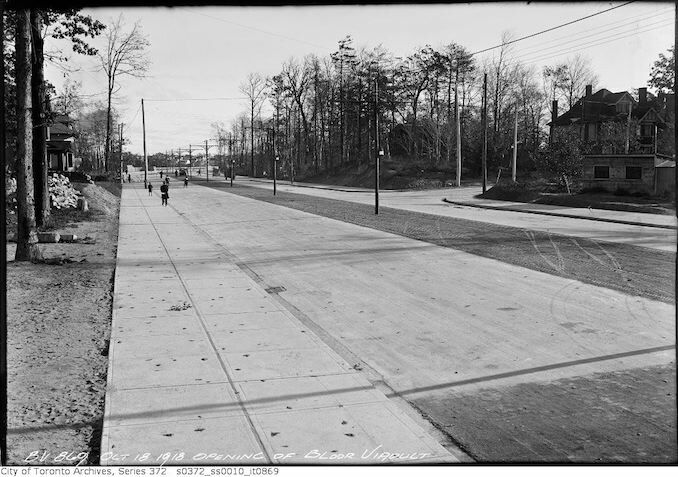 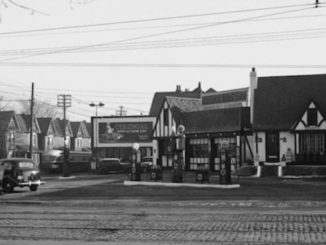 In 1909, East Toronto, located north of Danforth Avenue, and roughly as far east as Donlands Avenue, was annexed to the city. 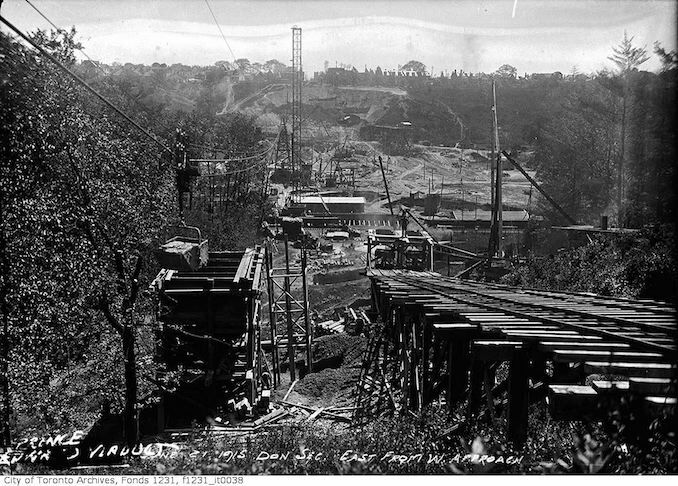 This began a quest to connect the two sides of the city, split by the Don Valley. 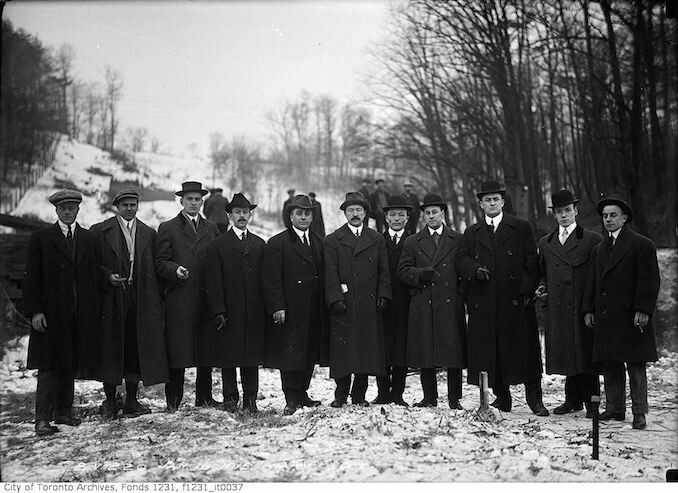 City referendum on the subject began in 1910 but it was not passed at first. 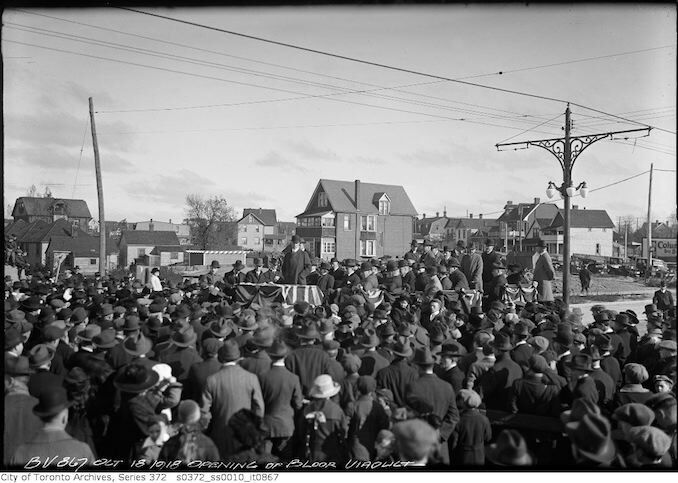 It took a referendum every year until 1913 before the voters decided to make it so. 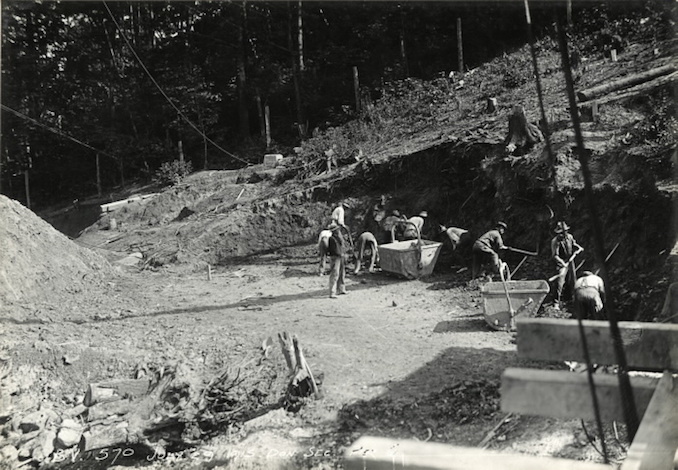 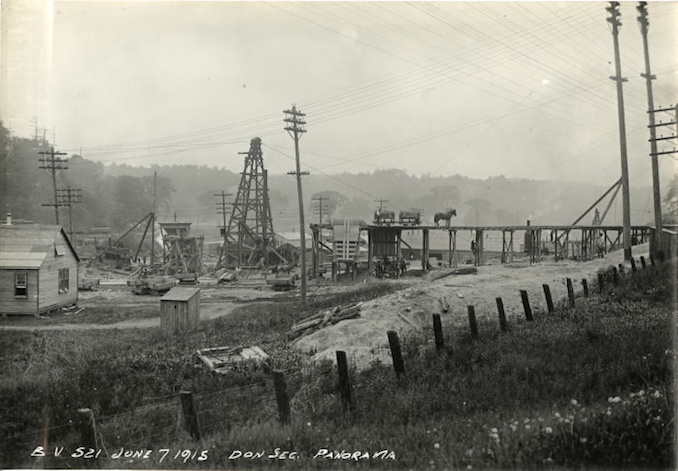 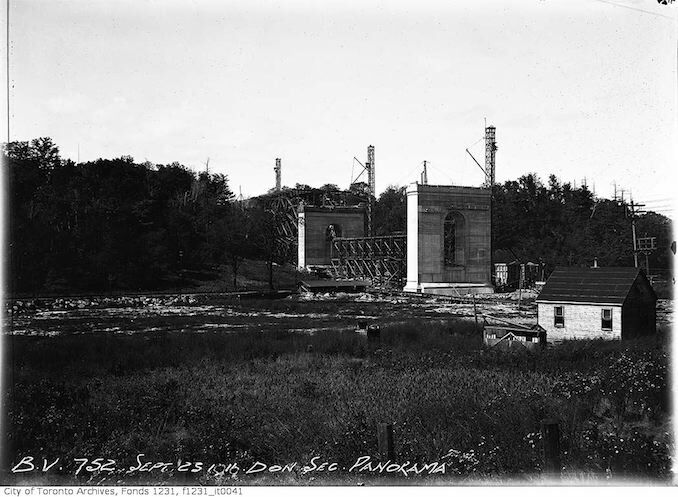 Residents voted against its construction in 1912 by 59 votes and in favour in 1913 by 9236 votes. 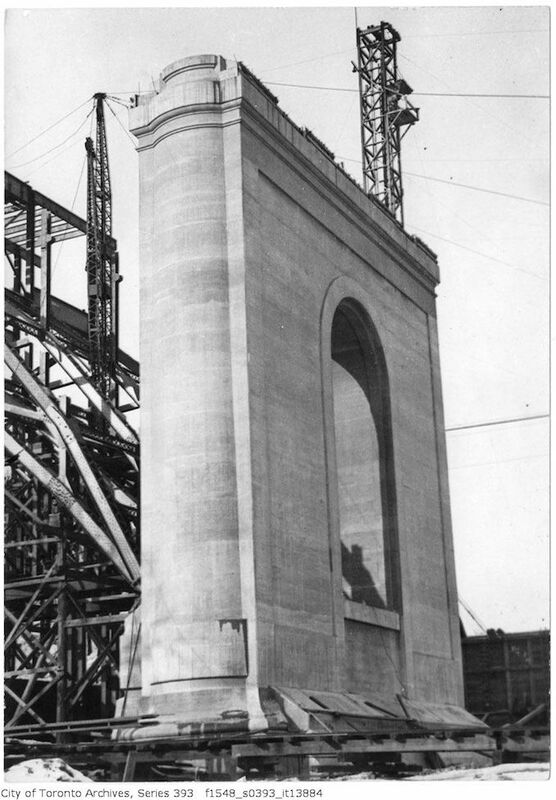 The cost of the construction was supposed to be CDN $759,000 in 1910 but was increased to CDN $2.5 million by the time it won the vote in 1913. 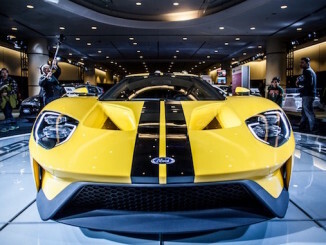 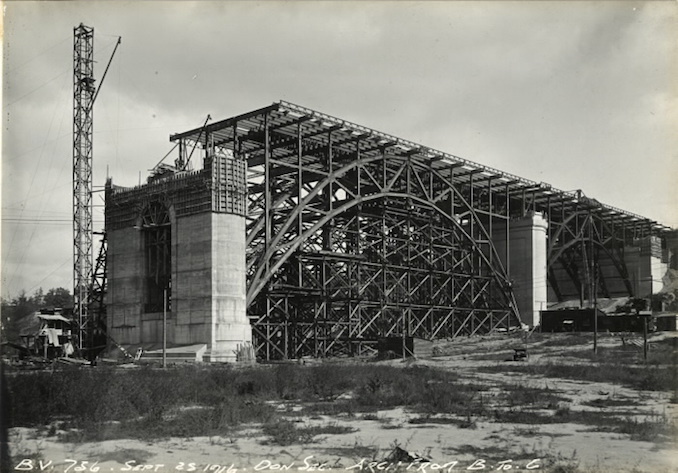 The final cost of the build was CDN $2,480,349.05 or roughly $35.8 million today. 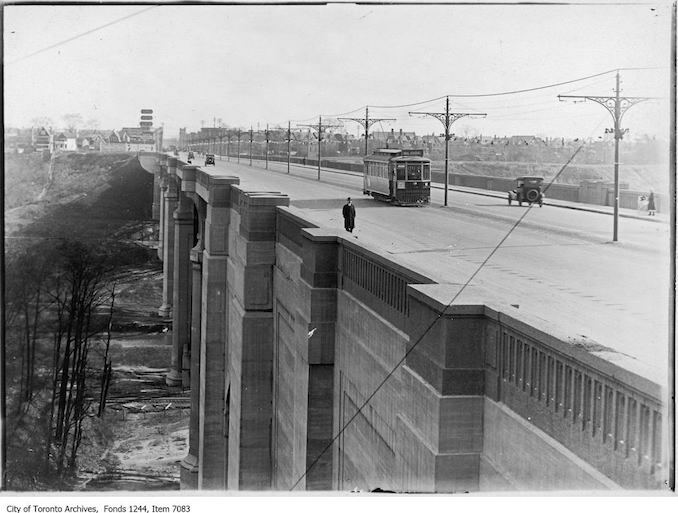 Luckily for the Toronto Transit Commission which opened its Bloor–Danforth subway line in 1966, the viaduct was designed to facilitate mass transit; its upper deck accommodated trams, while both the Don Valley phase and the Rosedale Valley phase included a lower deck for rail transport, controversial at the time because of its high additional cost. 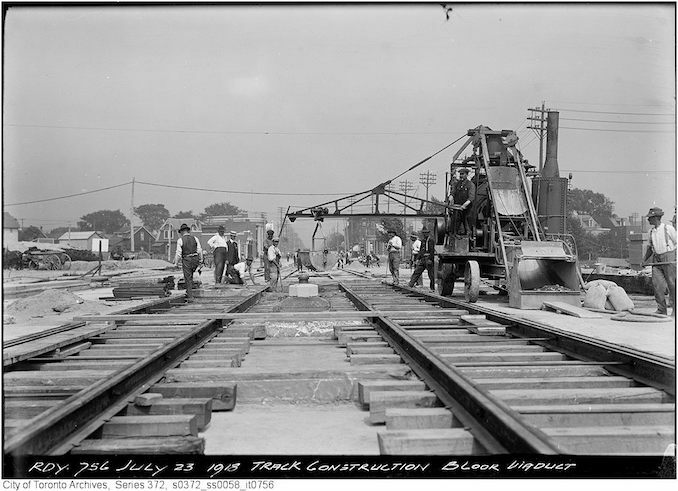 This saved the TTC millions of dollars in construction of the line. 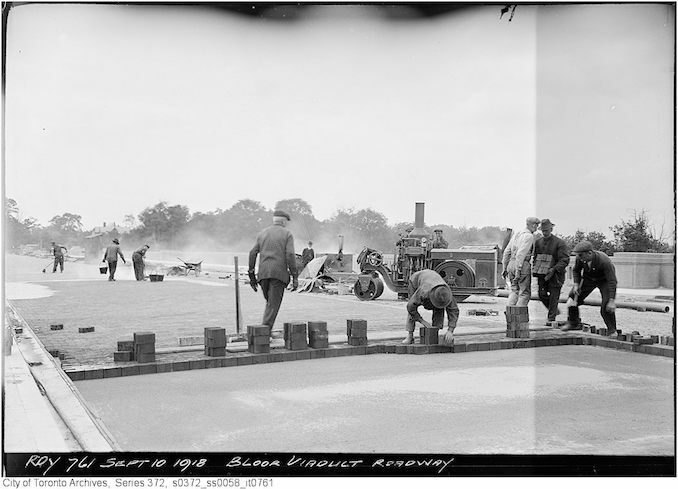 Here are some photographs I gathered from the build which took almost 4 years to complete. 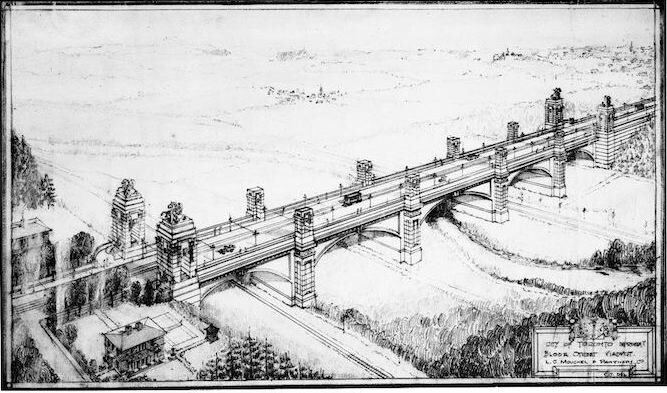 1914 – October 17the – Bloor Street Viaduct drawing. 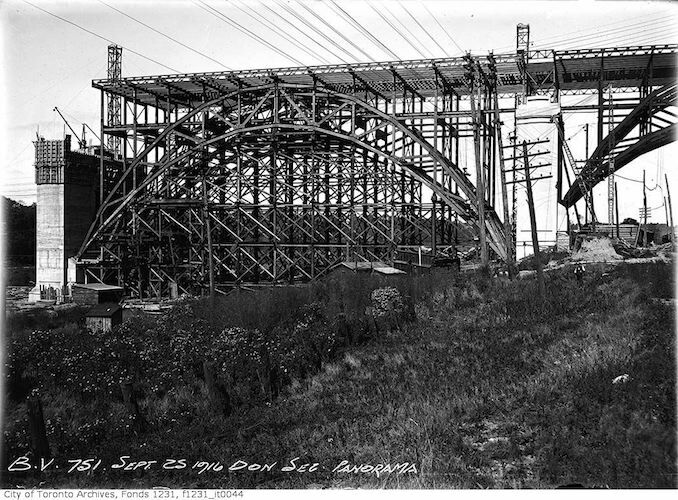 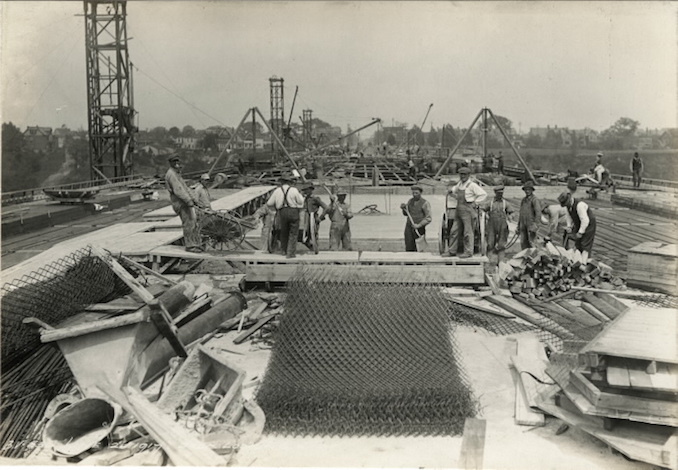 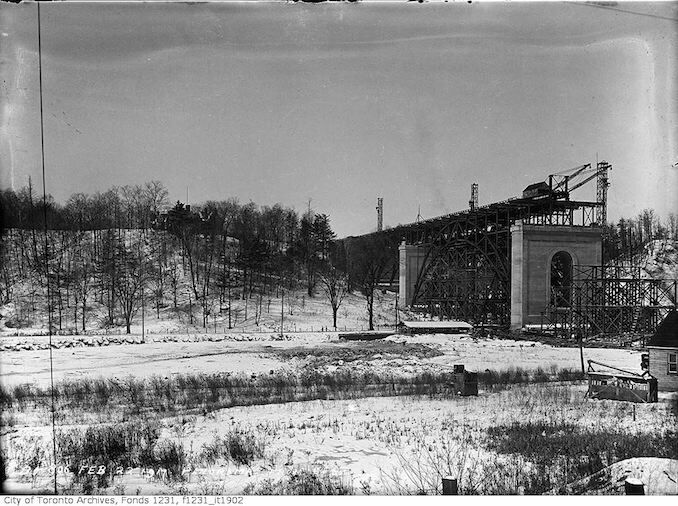 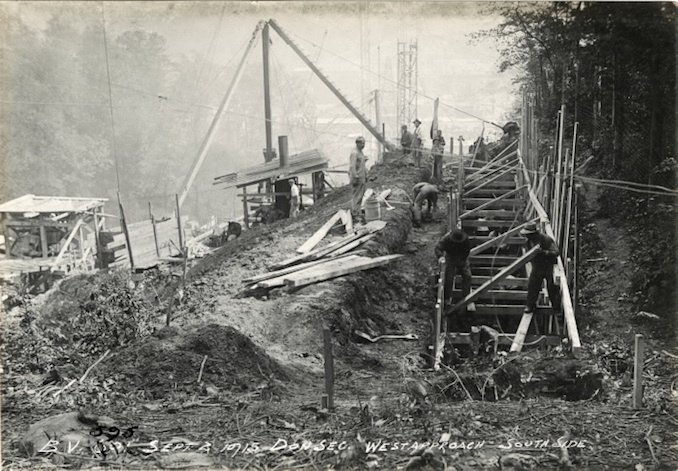 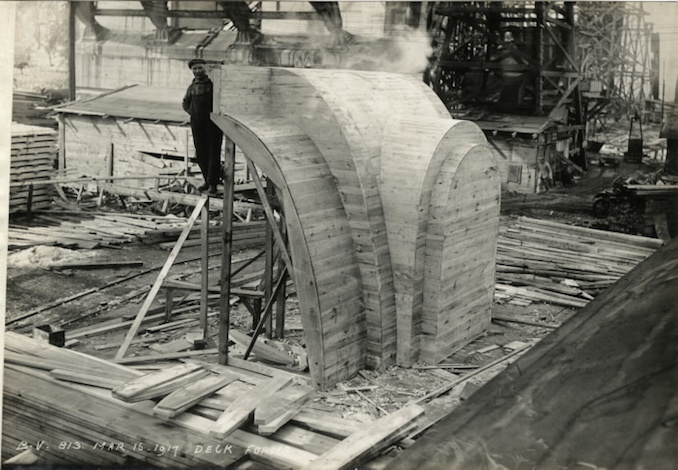 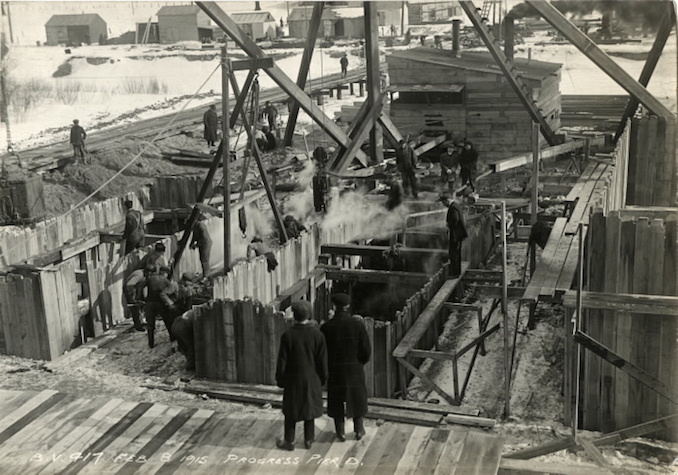 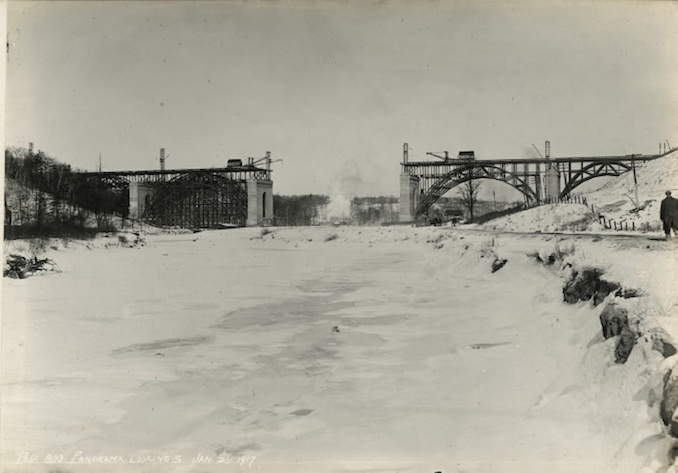 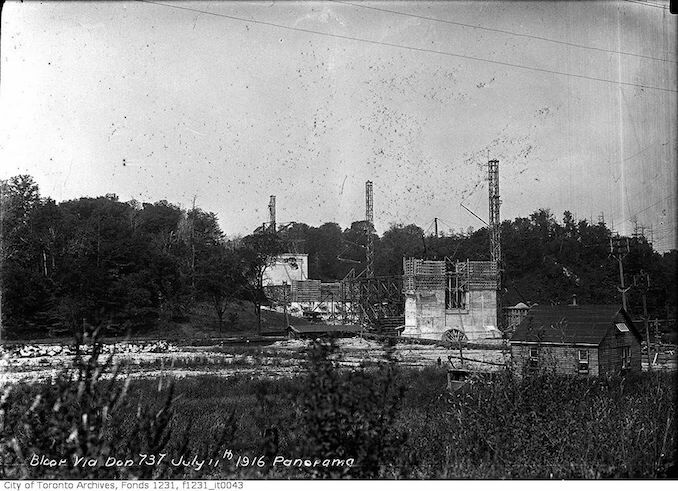 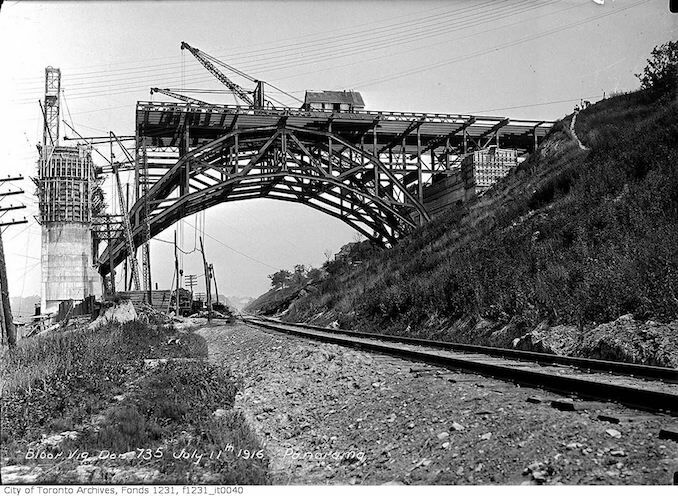 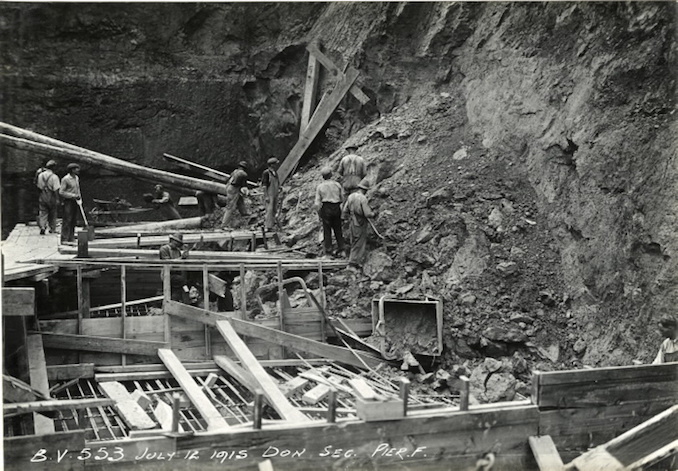 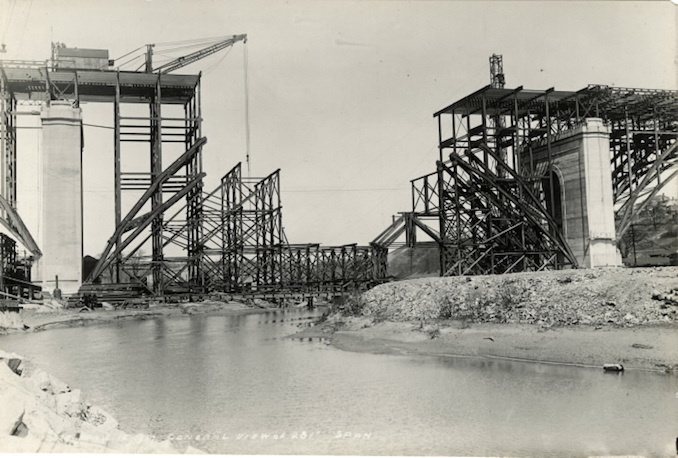 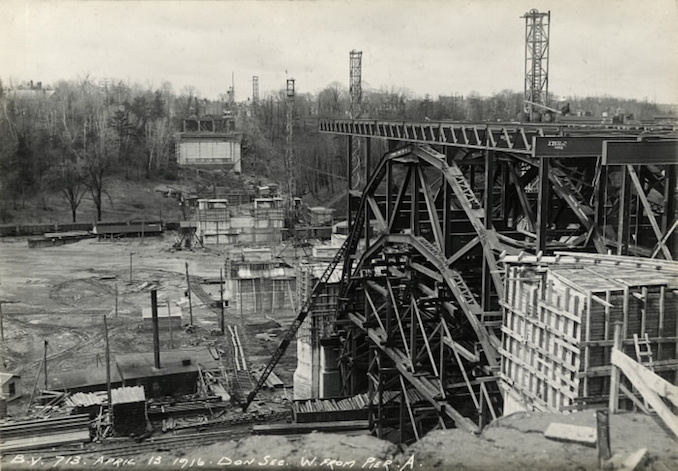 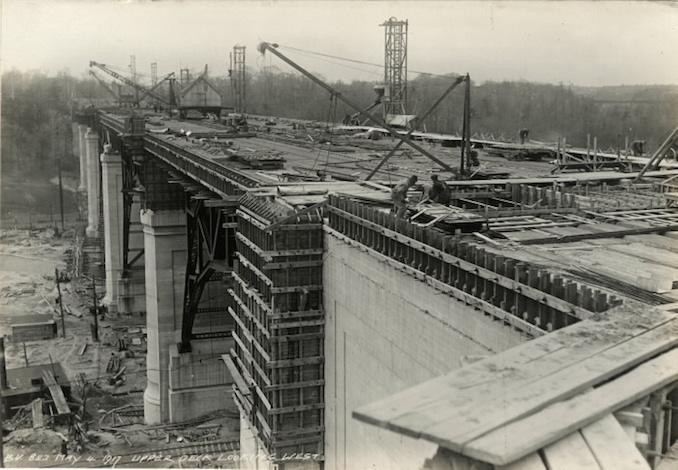 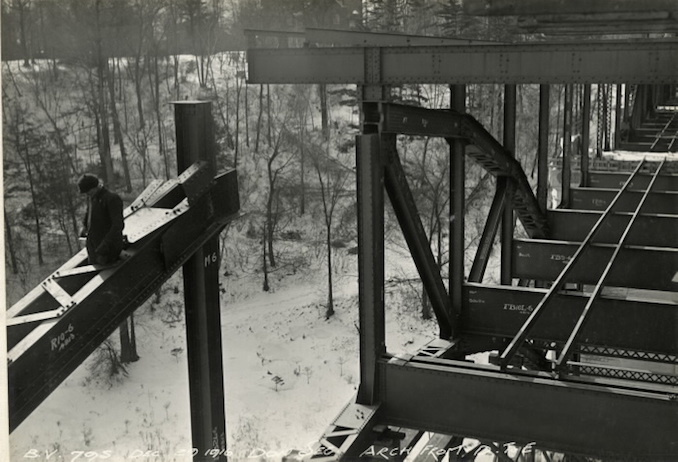 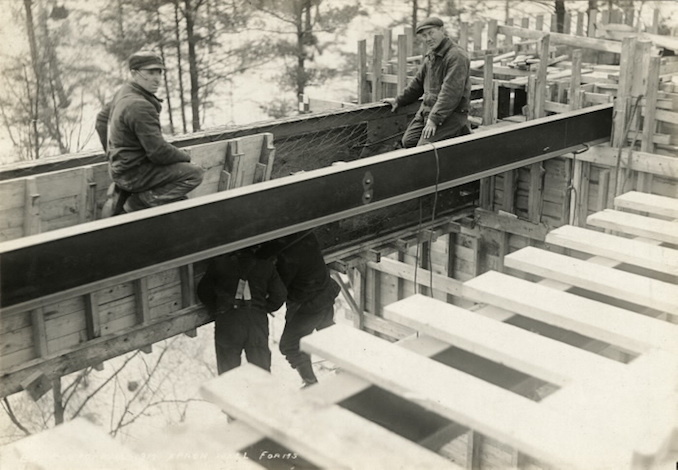 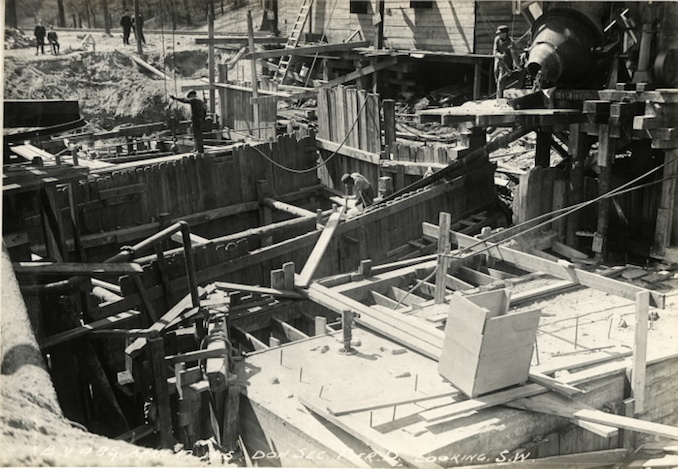 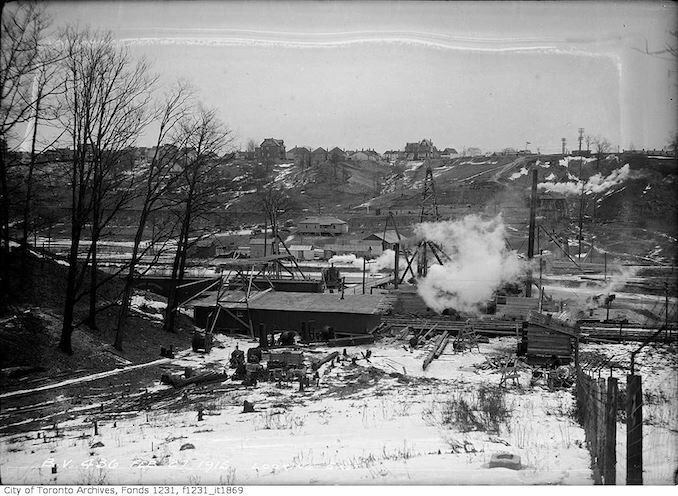 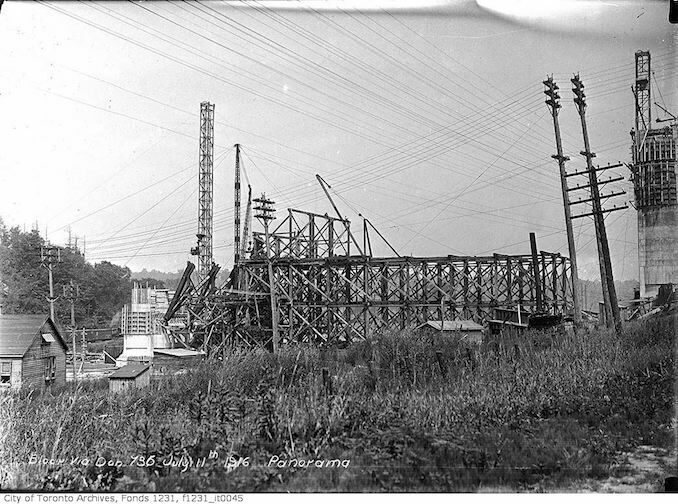 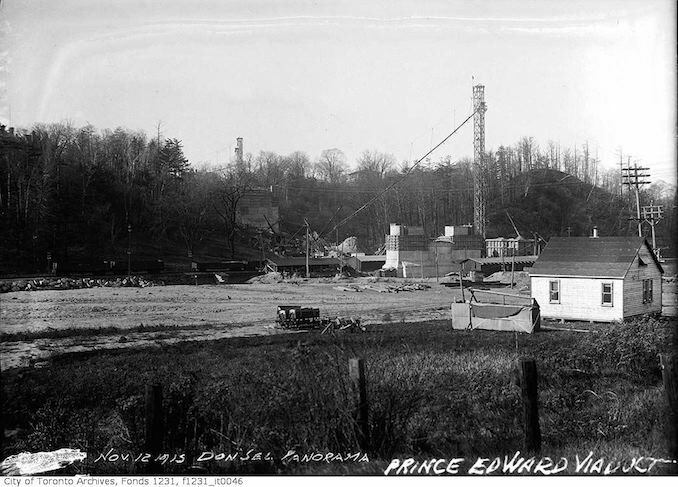 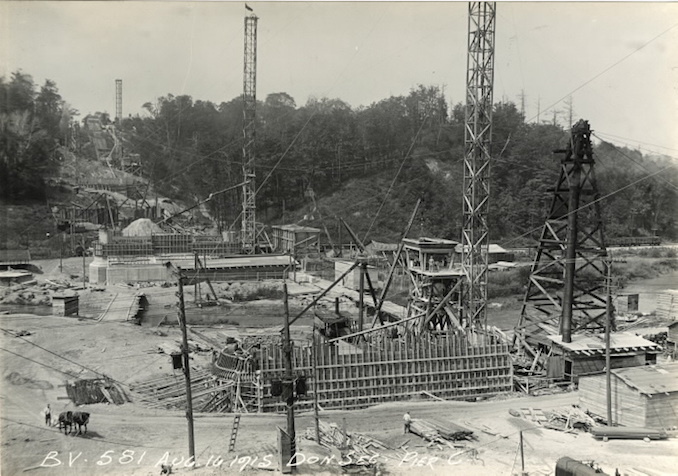 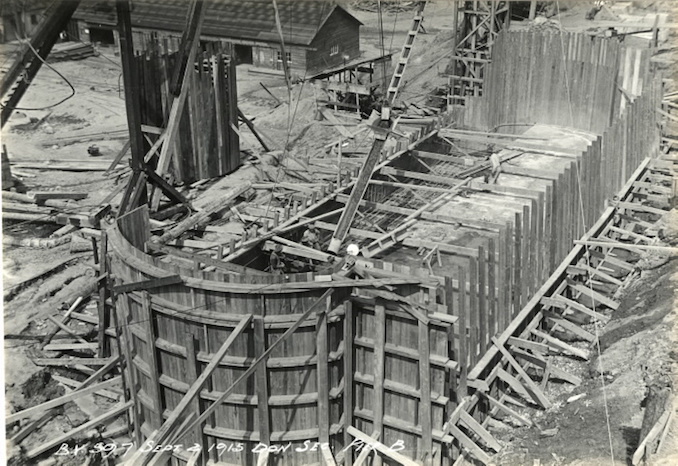 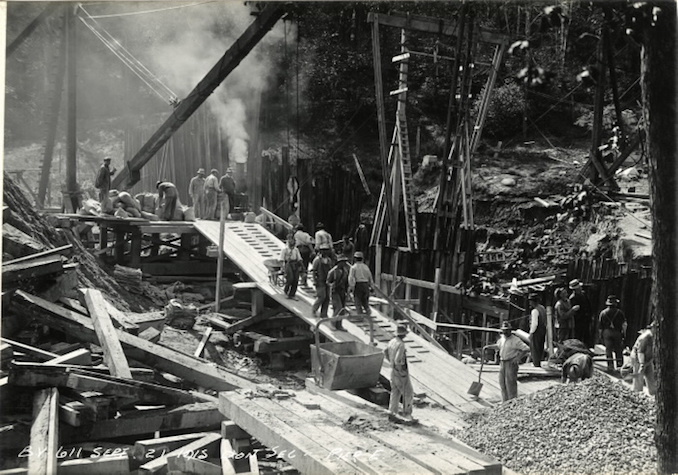 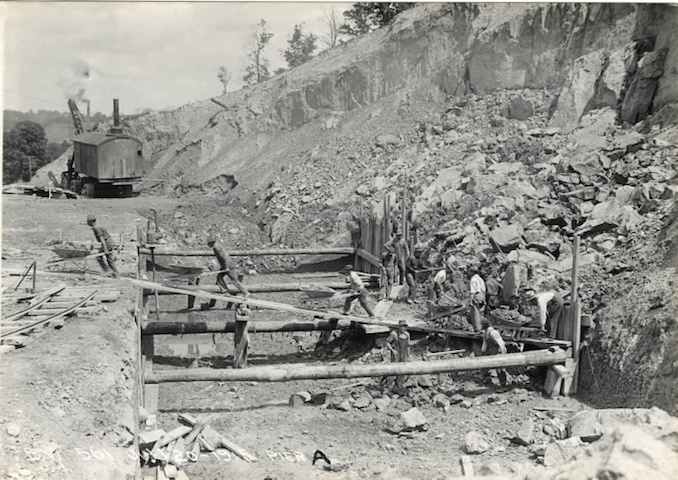 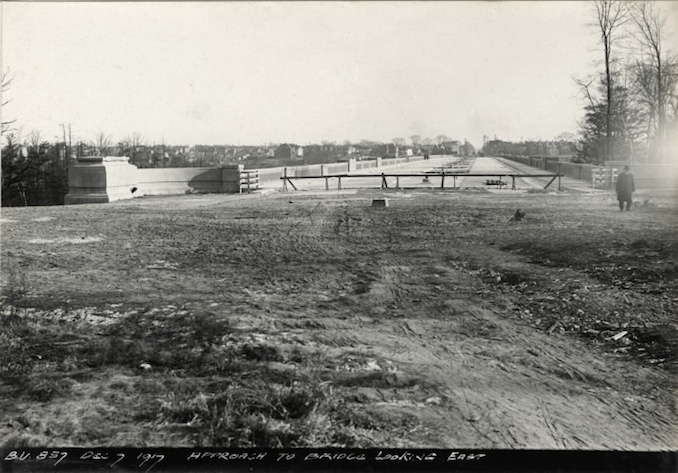 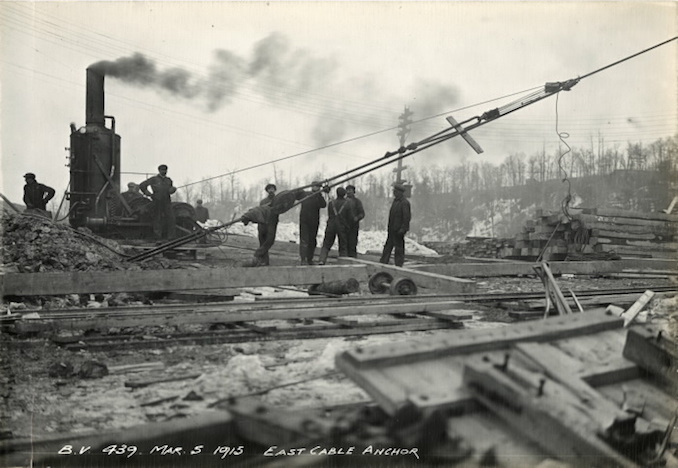 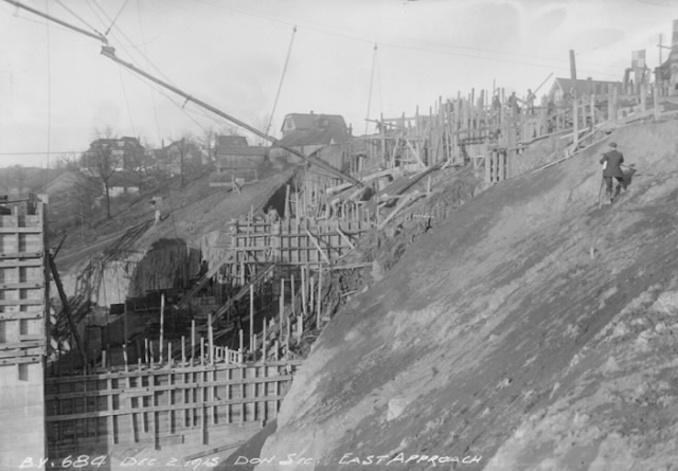 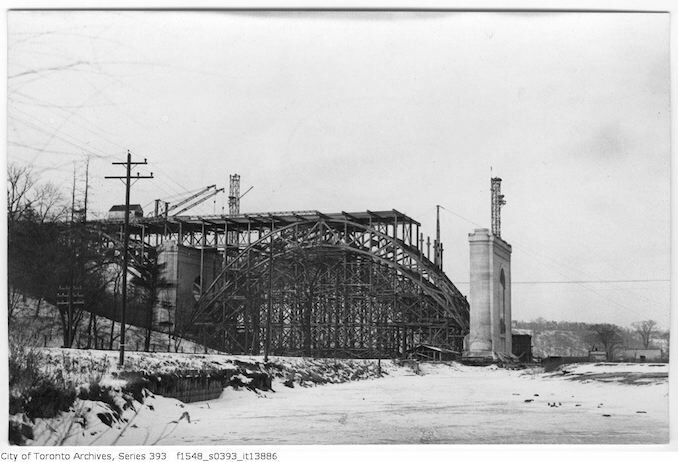 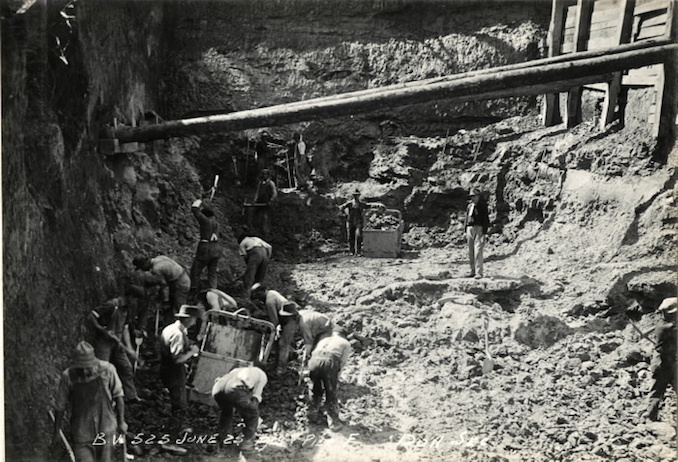 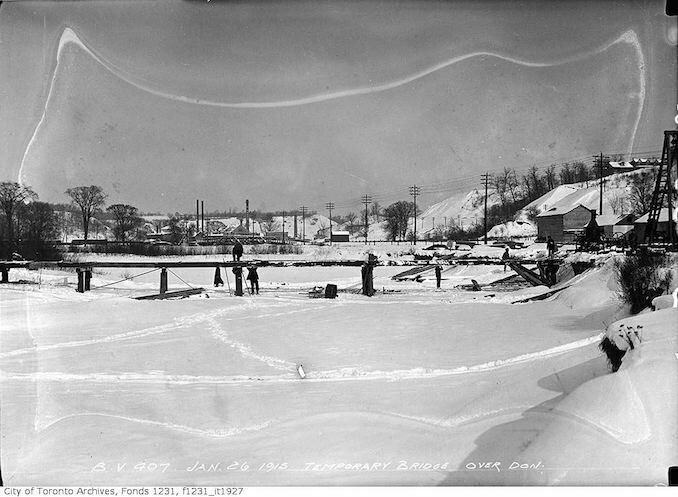 1916 – Bloor Viaduct under construction, Arch from D. to E.
1917 – February 22 – Bloor Viaduct construction looking west, panorama from C.P.R. 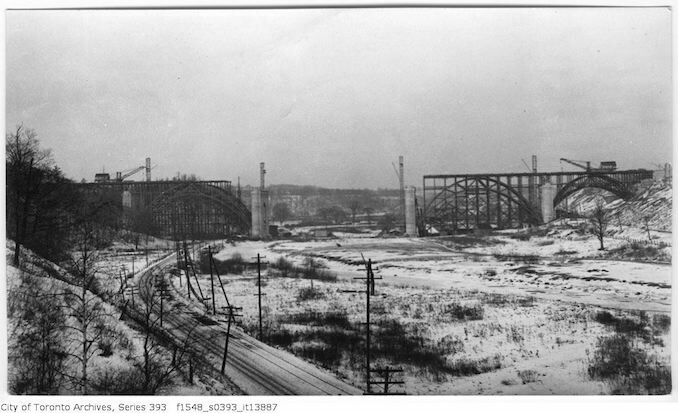 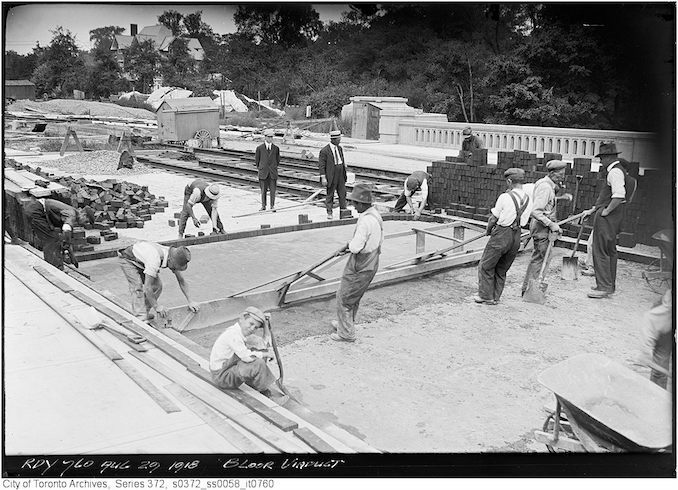 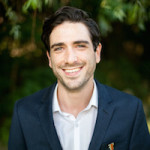 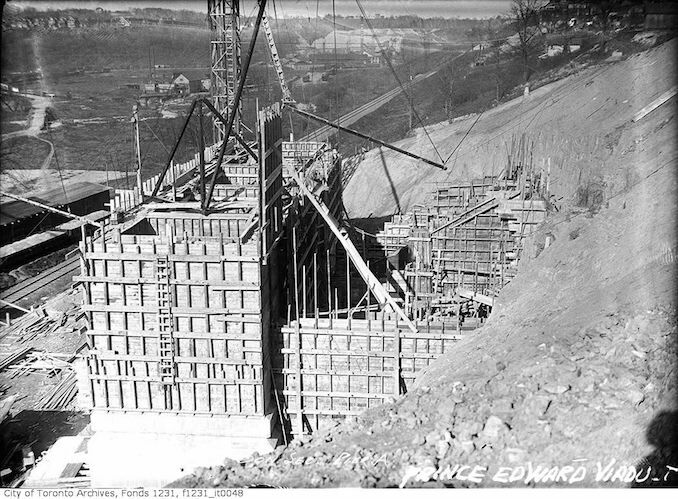 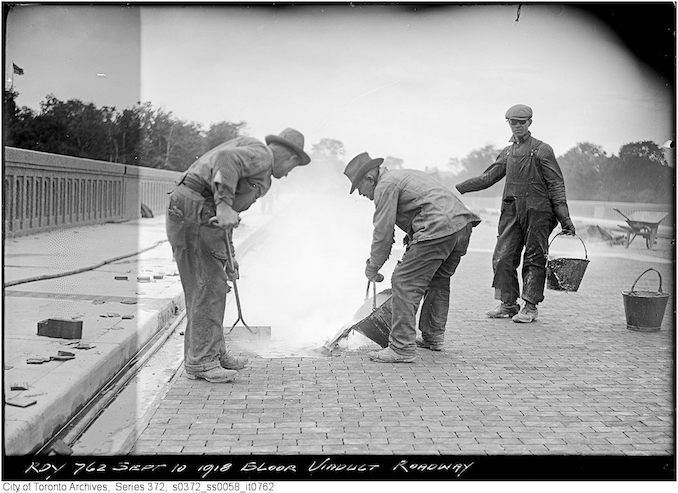 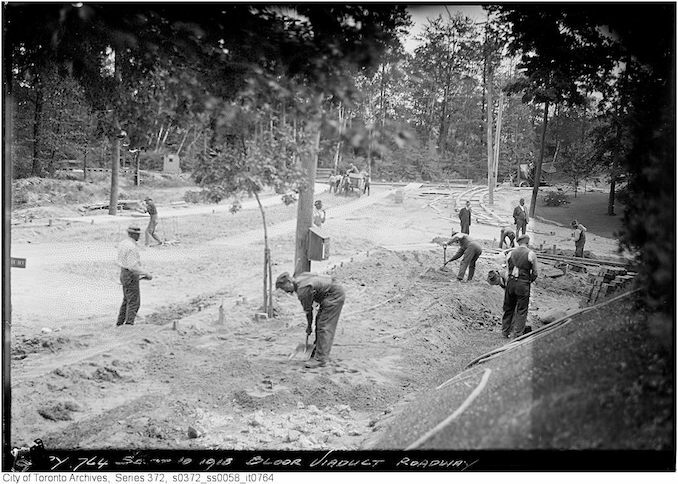 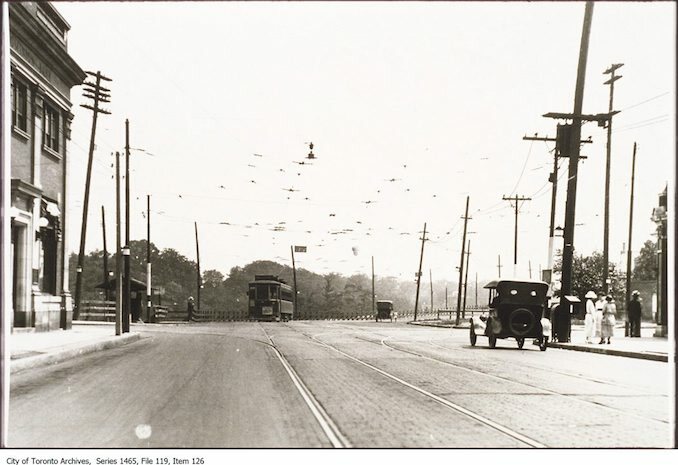 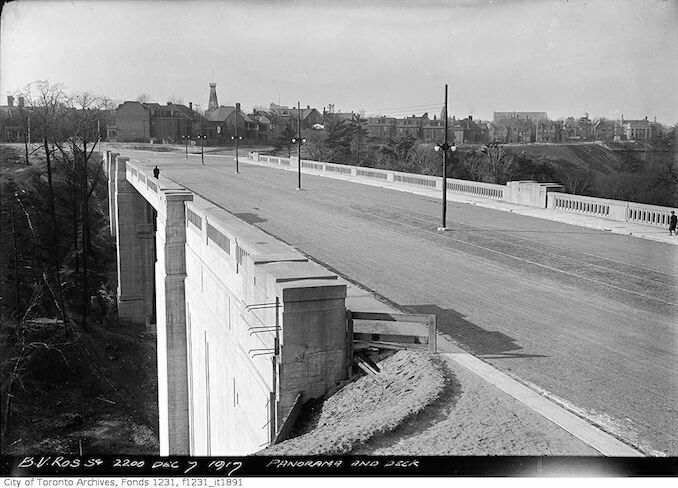 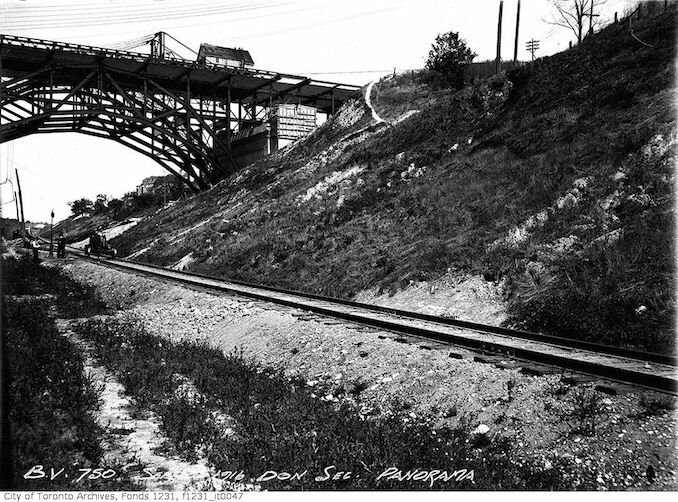 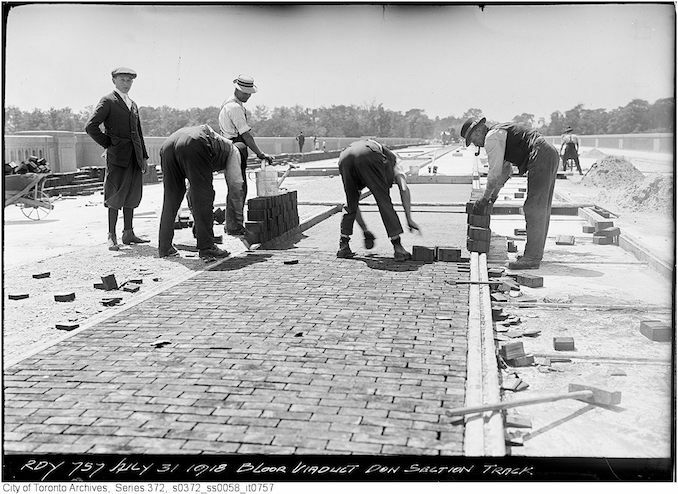 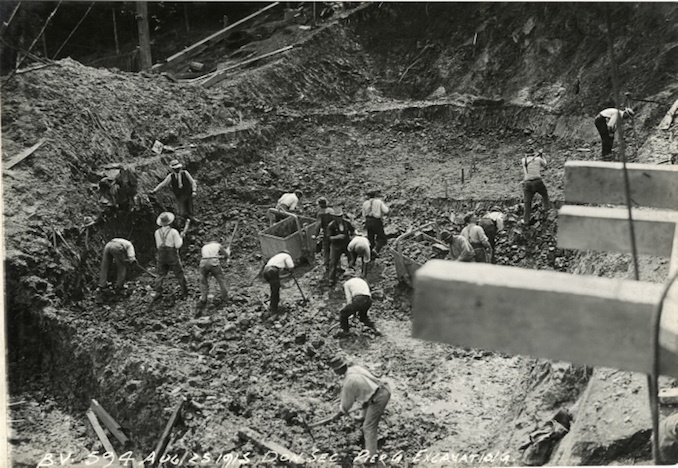 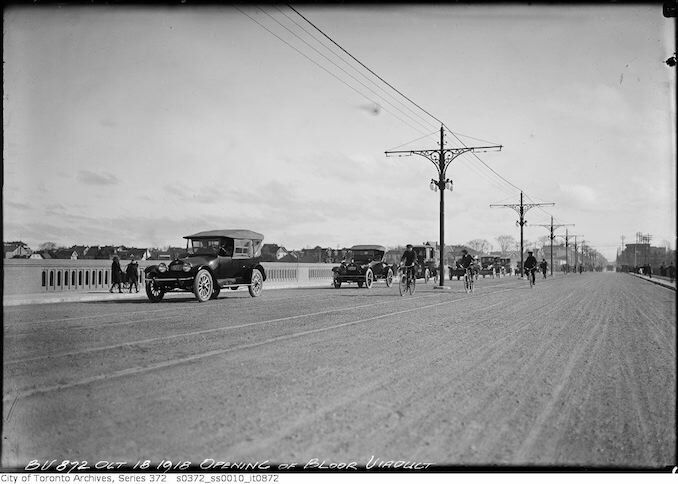 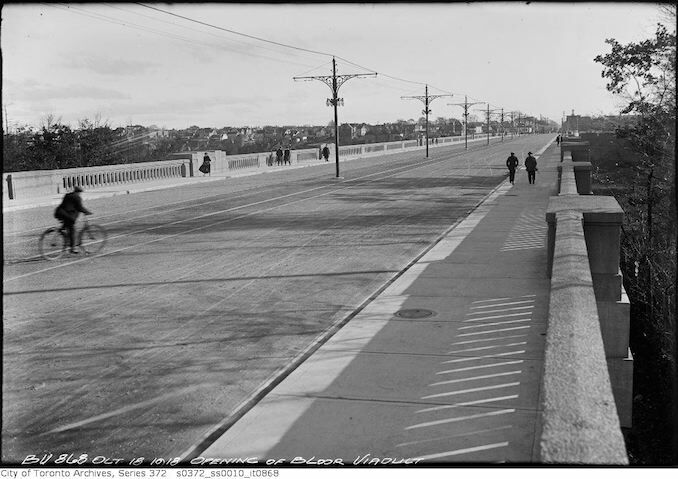 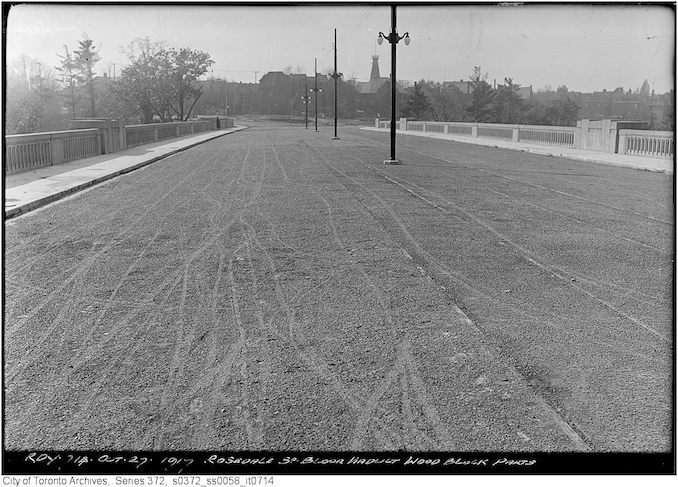 For an extended look at the story behind the Bloor viaduct, check out this great City of Toronto post. 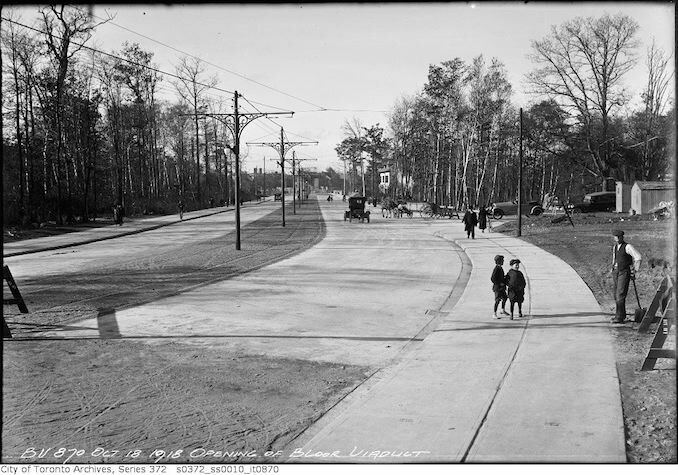 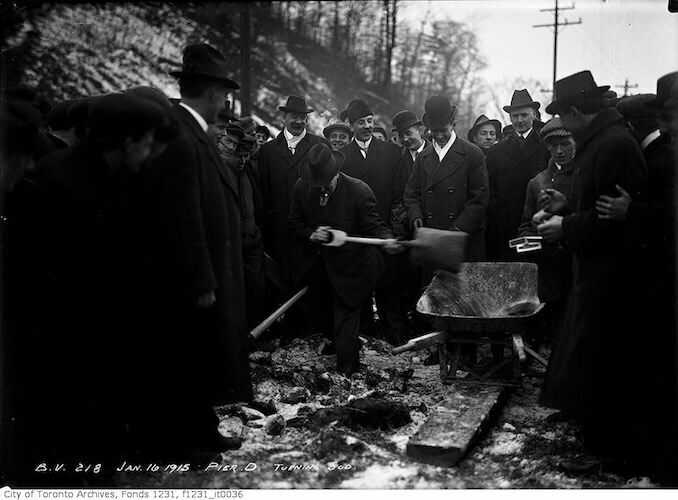 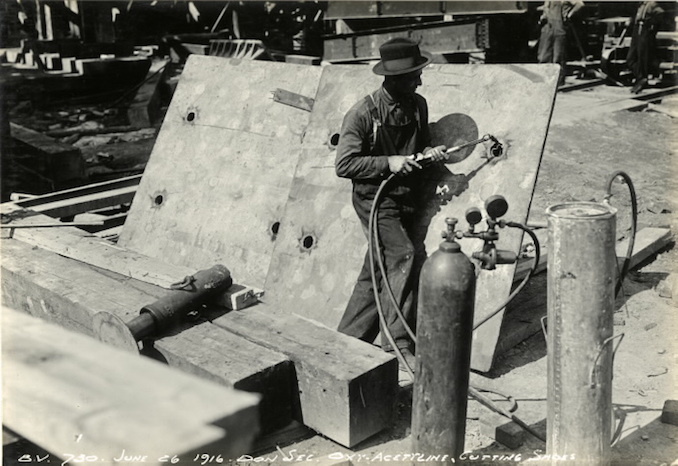 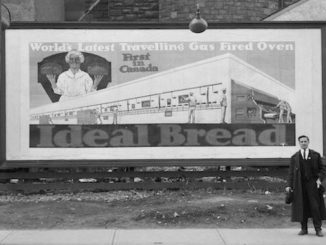 For more vintage photographs from around Toronto, visit the Toronto Archives or the Toronto Public Library archives.